Never seen one but they are carvable - un-carved ones pop up on ebay from time to time with high prices. The plastic ones are really useful and probably better (depending on how skilled you are at carving). You could always remove the fixing attachment of a plastic grip and ask your friend to fashion one for you to the shape, size and wood of your choosing. Me too, though I've seen it described as 'wood' and 'composition wood' (which I took to mean laminated). I seem to recall seeing a post on Flickr's LX section from a person who carved his own. I have the plastic grip and heartily recommend it. I got one. It was made in Australia. Beautiful. I love it. Do you know someone who makes them? 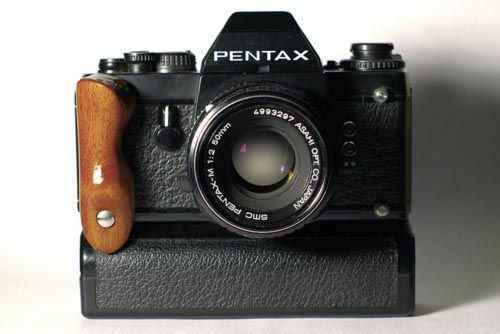 It would be nice to have a wooden grip. Lots of film bodies, a couple of digital ones, too many lenses (mainly older glass) and a Horseman LE 5x4.